The heat is on. Summer is here and all around Heronswood, flowers are doing their thing, producing a dazzling display. While undoubtedly attractive to us, flowers are actually sending a message to pollinating insects and birds. They’re saying “come collect our pollen and you’ll be rewarded”. The great diversity of flower shapes, colours and scents is thought to be the product of an evolutionary arms race. Plants have competed to attract a small pool of pollinators, with more elaborate and more colourful flowers developing over time. Pollinators visit blooms to imbibe sweet nectar or feed on nutritious pollen, but also inadvertently transfer some of that pollen to another flower, thus enabling plant reproduction and seed formation. One group of plants that exemplifies this huge range of colours is the true lilies in the genus Lilium. The word ‘lily’ is applied to many other plants: day lily (Hemerocallis), water lily (Nymphaea), peace lily (Spathiphyllum), lily-of-the-valley (Convallaria), but true lilies are restricted to Lilium. Residing across the Northern Hemisphere, these bulbous plants are much in evidence now at Heronswood. 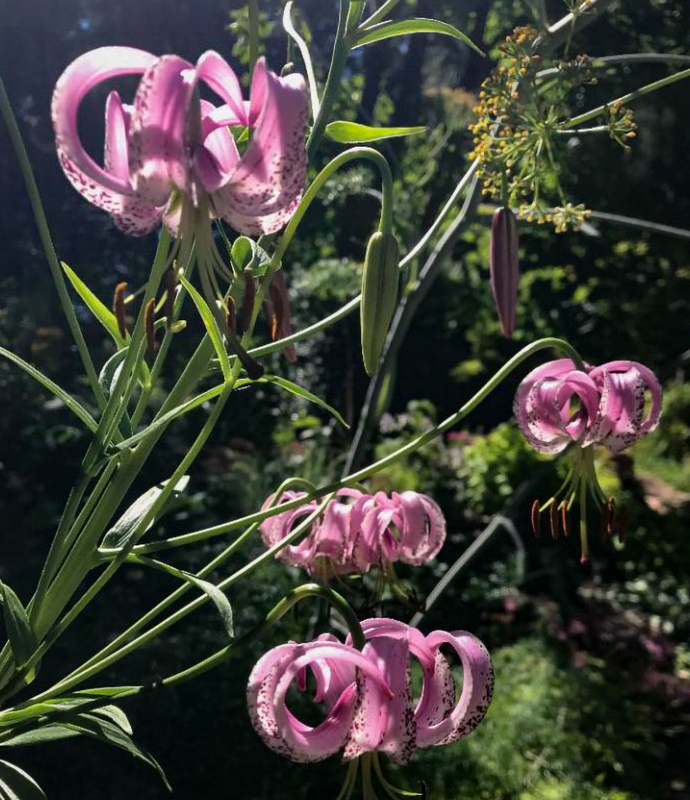 There’s only one native species in WA (Lilium columbianum), but thanks to Dan’s many foreign forays, we can showcase a broad swathe of different species. 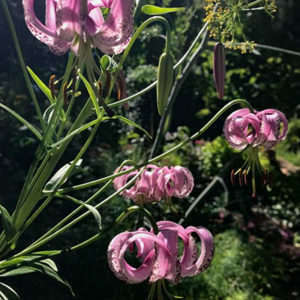 Look for Chinese Lilium lankongense in the Potager; its delicately dangling flowers are pale pink, stippled with red. Close kin is Lilium duchartrei, with white blooms mottled red; it is currently flowering by the North Bog. Wild lilies exhibit an impressive array of colors, but plant breeders have expanded this palette by hybridization and careful selection. In the back garden, you’ll see several stands of elegant Lilium ‘Orania’, the product of a cross between Trumpet and Oriental lilies. Look for the one fasciated plant, a strange mutant with flattened stems and masses of flowers. True lilies are an exceedingly useful group of garden plants and not just because they have such a wide variety of colors. Plants range in height from ankle-high alpines to veritable skyscrapers, many are richly scented, and there are plants for both sun and shade. They thrive in containers, making useful dot plants to plug gaps in summer borders. While wandering around the gardens, take a tally of all the flowering lilies and note down those that impress you the most. That way, when bulbs become available next spring, you’ll know just what to look for.